Meet Nitro, the happiest Greyhound you’ll ever see. The first years of his life were miserable – forced to race, and then cooped up in a cage for most of the rest of the time. Now Nitro’s got a great home with an owner who is fantastic enough to let him go wild and dig a huge dog pit in his yard! Look at how happy Nitro is at his new home. 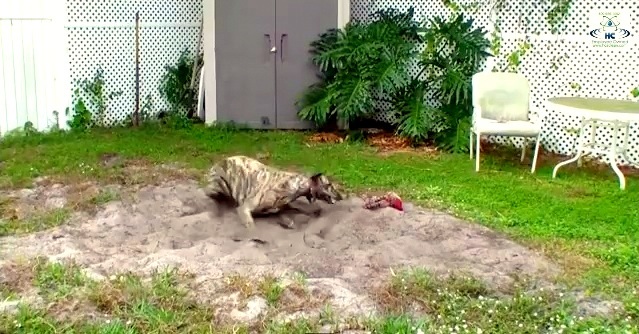 Nitro is able play in the sand and be a dog for the first time. The kennel handler at the race track said they never seen him wag his tail. He was miserable for the first couple of years of his racing life, being confined in a small cage most the day. Now Nitro is a 100-lb. greyhound that loves to sleep on his back with his legs completely stretched out. No, he is not overweight – he is big and very muscular. There were 45 amazing Greyhound dogs up for adoption on the day we went to see Nitro (racing name Atascocita Egor). That is way too many, so please help your local Greyhound adoption centers by adopting one of their dogs. Every Greyhound owner will tell you that they are the best one of the best dogs they ever had. They are very loving, easy to train and they are big couch potatoes inside the house. Nitro is also great with Viper, our new adopted kitten. You can go to www.Adopt-A-Pet.com, http://www.FriendsOfGreyhounds.org or http://www.petfinder.com and find the perfect pet for the holidays or anytime of the year. I think Nitro is looking for that pesky rabbit.